Do you have a world class wine that deserves a world class barrel? This is the best 30 Gallon French barrel we have used ... let us tell you why! It starts with the oak... these smaller barrels are made from the same premium-quality French Oak used to produce all of the world class Saint Martin barrels. Tight grain and high in phenolic extractives that add body and texture to your wine. The toast... fire toasted to a unique Medium Long toast that is between a medium and medium plus toasting level. If we took a 30 gallon barrel and a 60 gallon barrel and toasted them to identical levels you would find that the 30 gallon barrel had more toast impact on your wine. It many cases the medium plus level in a 30 gallon barrel is too much for most wines. The unique Medium Long toast is a great solution. The toasting fire is kept at a lower intensity but the barrel actually stays on the fire longer than a medium plus toasted barrel would. This results in very rich flavors that will taste very similar to wine aged in a 60 gallon Medium Plus toasted barrel. Your fruit is respected and not stepped on and you impart great structure and rich toast flavors... ideal? Yes! Francois Saint-Martin, third generation cooper, crafts Bordeaux style barrels for winemakers throughout the world. His emphasis has always been a profound respect of the fruit notes in his low-impact and elegant barrels. Francois Saint-Martin personally inspects the wood in the forests of Vosges and Allier. As a traditional Bordeaux cooper, Francois Saint-Martin likes to find the tightest grain possible and blend the forest origins to combine their qualities. The barrel exteriors have been sanded to a smooth finish. I've used these several years and they're great. Wine making. 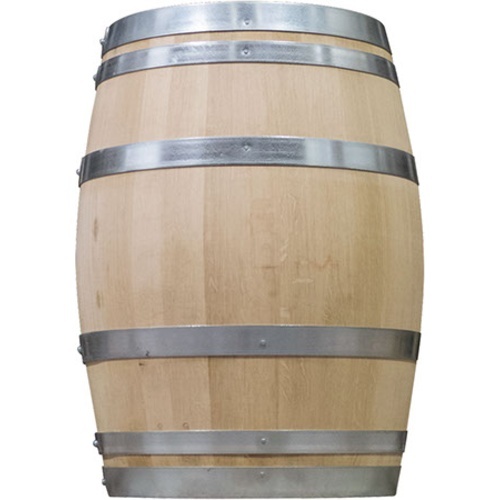 Wanted a medium french oak barrel and found this on the internet. Good price too. I have been using these barrels for a couple vintages now. The toast is spot on medium to medium plus. Strong oak flavors with caramel and vanilla in the first 6 months that mellows to toffee and mild oak after notes at around a year. The wines are spectacular and the micro-ox of the barrel makes all the difference for structure in the wine. Now my wines have body, long chain tannins, and are certain to age well for many many years. I am using new barrels for all my Syrah, Cab and Petit Syrah wines, with second/third uses going to my Primativos and Grenches. If you are making 36+ gallons of any full bodied red, this is the barrel you should be aging it in.